The list of courses offered by College Of Education, Igueben are displayed on this page. Candidates who wish to apply through JAMB should click on any of the courses to see the course requirements. 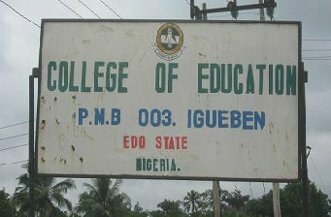 College of Education Igueben, Edo State is an educational institution .College of Education Igueben, Edo State is approved by National Commission for Colleges of Education (NCCE) to award National Certificate in Education in various courses. It is located in Igueben, Edo State. The school is operating from its permanent site located in Igueben. face physical experiences, and bringing their essence to life, not only through digital immersion creativity but through new technology as well including Virtual Reality As marketing professionals in the experiential world, we have become accustomed to the idea of an ever evolving industry. Critically analyze the activities of members of an environment. Demonstrate excellence and professional competence in teaching. Make a successful career in teaching and successfully qualified to undertake other degree programmers. How comes that of all that is written about the college, nothing is said about its year of establishment? This is a gross omission.